As posted earlier below as a teaser by Mark Darwin, we can confirm that YES we had a Truthology member WIN in the magistrates court here in Queensland yesterday when arguing the legitimacy of a traffic camera speeding fine. This victory could potentially have wide-ranging effects as a precedent. Why? Because it shows what we have suspected: it is highly unlikely that the Queensland Police are unable to issue any traffic camera infringement notices in the manner they have been doing so for as long as can work out …… perhaps since inception! That said, sadly, it will probably be short-lived as I’m certain that they will move VERY quickly to shut this down without doubt! But nevertheless, it is a significant win, and perhaps the beginning of the winds of change in bringing reform to our system. The man challenging the infringement issued to him, and doing the arguing, was no other than WA Lawyer Warren Black, a fellow Truth teacher and Truthology member, and we can assure you that he was on fire yesterday in the court ! Let me tell you, it takes big balls to walk into THEIR court and challenge them head on, especially when it has to do with their ‘lawful and legal’ ability (under their interpretation) as to whether or not they have the right to do so, and especially as he has so much to lose being a lawyer presently licensed under their system. He performed admirably to say the least, I was there, and enjoyed every minute of it. The alleged infringement was issued by the QLD Police, and was for the sum of $150 and a loss of 3 points, for allegedly exceeding the posted speed limit by only 14kms per hour. It was quite amusing that in the early stages of the trial, a young police prosecutor spoke directly to Warren. He tried belittling the attempt as a complete waste of time and resources for all concerned, that Warren should just pay the fine and be done with it, and had little chance of success, and the result for the effort did not warrant Warrens outcome! Needless to say, Warren let that slide and continued on with the matter at hand. Now in this instance, Warren was arguing a number of points. The main issue that Warren was arguing was that the infringement was issued under the personal name of the officer concerned, a local Police Sergeant, supposedly on behalf of the Queensland Police force. However, as Warren pointed out, there is currently NO AUTHORITY or LEGISLATION in Queensland of any sort in place the grants this person, the right to do so, and even if it did, it must be clear that the police officer is doing the prosecution on behalf of the relevant authority, eg. 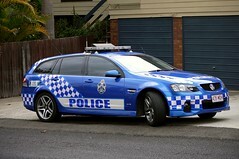 Queensland Police, the Crown or State. The Police tried to duck and dive, and circumvent this in every way possible, bringing up other issues, but to the Magistrate’s credit, he remained firm and told the Police to answer Warren’s question and provide the relevant proof. Warren also raised some other points. He raised the point that the Queensland Police, SPUR, the Crown, the Queensland Government, are separate entities, yet somehow all involved in the issued infringement. He raised the point that for an entity or Government to raise an infringement, it had to be written in legislation as under any kind of criminal law, an offence had to be clearly specified, and the chain of legislative authority as to who ultimately prosecuted had to be clear. He wanted clarified as to who was who, and what role they all played in this infringement, and where they were mentioned in legislation or regulations. Again, to the Magistrate’s credit, he agreed with Warren, however this argument was not explored in-depth, nor was it ruled upon. He also raised the point that if the matter was criminal and not civil, the issue was, who was harmed and suffered loss as a result of the alleged infringement and who was the accuser in the matter? (as previously outlined in our website templates) If the Police Sergeant issued the charge, was he personally harmed, and if not, who was harmed, and which entity did he represent! Again the Magistrate agreed, and insisted the Police show their authority. What was amusing was there were 5 (FIVE) Police officers in the court yesterday, including the head of Brisbane’s Traffic Camera Branch (so we believe). The trial went from 9.30am till 3pm with more than 6 adjournments, (requested by the police) so that they could find ANY legislation or Authority (which they couldn’t) to hang their hat on and make their case. They literally tried EVERYTHING to find it….. let me assure you it was EMBARRASSING to watch them squirm for SO long and the prosecutor was forever saying…”can we just adjourn for 5 minutes so i can ring my boss”…SERIOUSLY !!! The lengths they went to were extraordinary, and they even tried to withdraw the infringement, and issue a ‘bench warrant’ on the spot to get around it. As correctly pointed out by the Magistrate, this action would be an abuse of process and he instantly rejected it! What was fantastic about this case was the Magistrate was very fair and unbiased and was firm on both Warren and the Police about procedural fairness, and following the law. He seemed quite amused at the police incompetence in trying to justify their position, and granted them more than enough time and adjournments to try and get a result. He even appeared to give them a chance to withdraw the charge, which they refused to do, and at one stage, he suggested to Warren with some humour that he may wish to “plead guilty to bring this veil of tears to an end”! Ultimately the Police dodged a bullet, as the matter was won on another issue. The Police tried to adduce camera evidence, however, Warren challenged it on the basis that the Police had not provided him with witness statements from the camera operator. The Magistrate agreed, and excluded the evidence, so the Police had no evidence to base a charge. The Magistrate proceeded to dismiss the charges, and then grant all costs to Warren for his troubles. Warren literally had them on the back foot for the entire trial, and then slowly on the ropes, then on their knees, and finally WHAMO …..KO’d !!!!!! a truly fantastic result. It is important to note, that in Western Australia, they DO have this power outlined in their legislation. You can bet after yesterdays court win, that Queensland will pass similar legislation for future use … so if you are challenging speeding fines now… and want to use this argument and be QUICK about it!…. you will have to check for yourselves in all other states. What also happened was Warren and I had a number of talks with the Police there, and as time went on , we became more and more friendly. Warren made it clear to the Police that he was totally supportive of road safety, however, he did not agree with a system that undermined the rights of citizens, and swung the balance to favour in favour of the Police. What was interesting was a few of the Police agreed with us, and were very open to where we were coming from! This entry was posted in News Archive and tagged bench warrant, Brisbane, camera evidence, infringement notice, Lawyer, Magistrate, Magistrates Court, police, Police officer, police prosecutor, police sargeant, precedent, QLD Police, Queensland, Queensland Police, rights of citizens, road safety, Sergeant, speed limit, speeding fine, SPUR, traffic camera, Traffic Camera Branch, Warren Black, Western Australia, witness statements by renaissancelearningfoundation. Bookmark the permalink.